What would happen if you were challenged to spend the next 72 hours out in the wilderness with only what you could fit into a quart-sized container and the clothes on your back? Do you think you could survive the experience? What if it were the dead of winter? What if there were no modern conveniences? Would you be tough enough to make it through? Starring: Samuel Gilmore, Crusoe Johnson, Sharar Johnson and Zadok Johnson. I enjoyed watching this with my boys. Challenge to learn how to rough it. Everything was good about this movie except the music. The message, the encouragement to manliness and making God the center of it, is all good. I wanted this for my grandsons, to encourage them in the ways of "roughing it" with God just a natural part of life. The only negative thing about it, was that some of the music had a back beat, which isn't good. I bought 3 of them and wish now that I could return them. On one hand I still would like to have our grandsons get the message and the encouragement to manliness, God-centeredness, and not just ease, but on the other hand don't want to encourage the use of music with a back beat. This was a good challenge to teach young men how to rough it. In our society where fellows many times are more interested in ease than developing manliness, this is a welcome message. God and His ways are included throughout, in a natural way. The only negative about it was the music. There was a back beat in some of the music that was quite disappointing and made us wish we hadn't bought it, and could return it. I wanted our grandsons to see it and be encouraged in the ways of Godly manhood. If it hadn't been for the music, this movie would have been perfect for this. This movie is very good. It is quite a challenge that these 4 young men took to see how they could make it for 72 hours in the great outdoors with nothing but what was on their backs and what would fit in a quart jar. This is something young men would benefit by. The only negative comment that I would offer is that some of the music carried a back beat. This was a disappointment and made us think we shouldn't have bought it. The message is timely, well done up and is a good one, especially in our day when so many young men seem to be more concerned with ease than developing manliness. If it could just have had different music, without the wrong beat, it would have been perfect. The movie was somewhat of a disappointment. Our boys were expecting something a little more challenging. We hunt, fish and camp often so this movie was more like a normal day in the life of our family. Our children said that if they weren't used to these activities it would have been more thrilling. Perhaps city children would find this more exciting. That being said, I personally thought it pretty cool (spoiler ahead) that a boy could actually fit the working parts of a pellet gun into his quart jar! 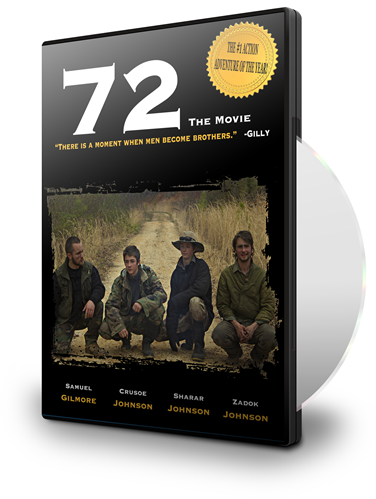 Click the button below to add the 72 The Movie - DVD to your wish list.